Is it just me, or does this seem like one heck of a deal? Finding outdoor loungers that are comfortable on the backside and easy on the eyes can be a daunting task for someone that appreciates a pared-down approach, so seeing a less-than-$400 option is a nice surprise. 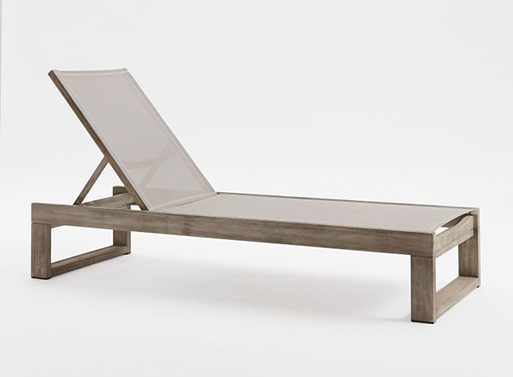 This lounger is made from sustainably sourced wood and features Textilene® fabric for extra breathability. Plus, it’s on sale, which makes the deal even sweeter (and 25% off for a limited time with code provided on site). 27″w x 81.8″d x 42.1″h. Solid wood with wire-brushed surface. Back reclines to 3 different levels. Outdoor cover available (sold separately). 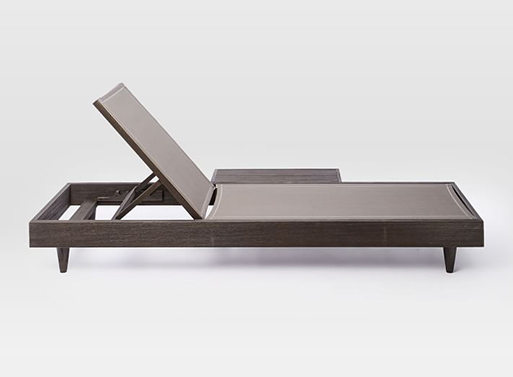 There’s also the Portside Low Textilene Chaise Lounger that has an attached side table. Its price point is a bit higher at $759 on sale. Available from West Elm, $389.00.